Did you ever have a recurring dream that you were chasing someone or some thing and just as you were about to catch it you woke up? Well, trainer Keith Desormeaux has had that same dream since last June when he started chasing Nyquist. 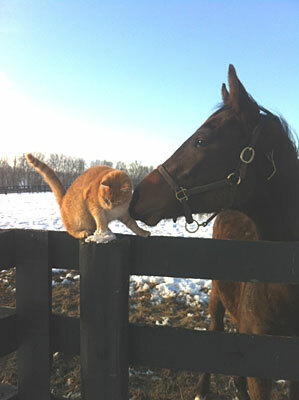 Each time he would get closer, whether with Swipe or Exaggerator, but would always wake up to the harsh realization that it was not a dream after all. Nyquist was not a phantom of his subconscious, but a living breathing entity that was always one step ahead of him. Well, thanks to a sloppy track that he relishes, kamikaze tactics with Nyquist, and just plain improvement combined with talent and a new souped up engine, Exaggerator finally has caught up with his nemesis. The Exaggerator alarm clock was deafening. Keith Desormeaux woke up from his dream after having finally caught the elusive Nyquist. And those who thought of Exaggerator as a one-turn horse and not classic material after the San Felipe woke up as well. Although it was sad to see Nyquist suffer his first defeat when he ran such a gallant race after battling through a suicidal opening quarter as the meat in a speed sandwich, no one was more deserving of nailing down a classic victory than Exaggerator, who has been a remarkable horse in his own right since he set foot on the racetrack nearly a year ago. In his four losing efforts against Nyquist, he’s gotten closer to him each time. This is a horse who has finished in the money at seven different distances from six furlongs to 1 1/4 miles at seven different racetracks from New York to California to Kentucky to Louisiana, and he’s done it on fast, muddy, and sloppy racetracks. Since his career debut when he finished fifth, he’s been on the board in 10 consecutive races, including five grade I stakes, three grade II stakes, and a grade III stakes. What has been most remarkable about him is the how Desormeaux was able to change his running style from mostly a one-paced stalker, who would lay one to three lengths off the lead without a great deal of acceleration in the stretch to a stone closer with a devastating turn of foot, who came from 16 lengths back to win the Santa Anita Derby by 6 1/2 lengths with a spectacular last-to-first move on the far turn and from 17 lengths back to finish a fast-closing second in the Kentucky Derby. In the Preakness, he came from nearly a dozen lengths back, quickly moving into contention down the backstretch. As he’s shown in his last four starts, he can lag far back and turn on the afterburners at any point in the race. This was as dramatic a transformation as anyone has seen in years, or ever for that matter. Ever since he was baby, Exaggerator endeared himself to those around him with his engaging personality. “I named him Buster,” McCormack said. 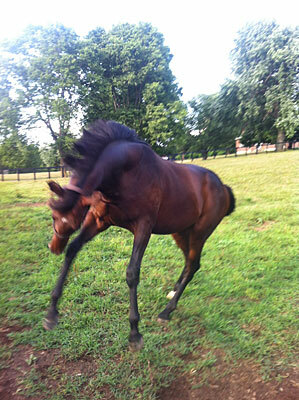 “He was always a playful colt in the field, but was a workhorse to prep. He was a very confident colt. (His dam) Dawn Raid seems to stamp this in her offspring. 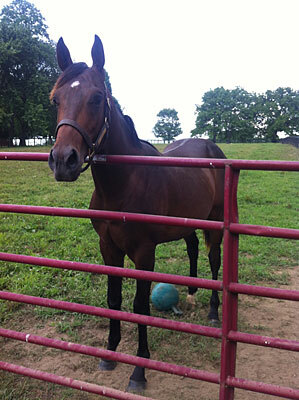 He loved Jolly Balls and would gallop down the fence line and throw it over the fence if someone walked by. He would throw it directly at them, as if he wanted to play fetch. The few visitors we had would get a real kick out of it. He also did the same thing with feeders, salt holders, etc. If someone would throw it back, he would run after the ball or feeder and throw it over the fence again. He would do this as long as he found it entertaining. I could usually find the Jolly Ball outside of the gate with him looking at it. 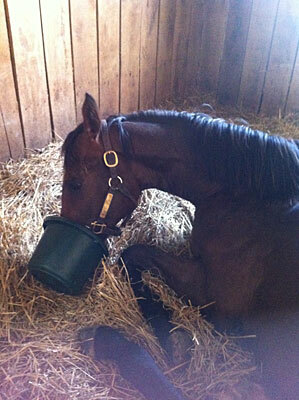 “He would always lie down in his stall during the day and demanded to be fed this way. He would never get up for his feed. He would just lie there and wait for me to put it under his face and then eat it while lying down. Buster never went through a real awkward stage other than catching up to his legs a bit. He always looked great and took new things in stride as if he was expected to do them. Exaggerator sold at the Keeneland September yearling sale for $110,000 to Big Chief Racing. “At the time of the sale, we weren’t sure how the Curlins were selling, and we were satisfied with the price,” McCormack said. At the sale, he was turned over to Warrendale Sales, who acted as agent. Exaggerator was a top-class 2-year-old right from the beginning, breaking his maiden at Del Mar in his second start and then shipping cross-country to Saratoga, where he captured the grade II Saratoga Special in a sharp 1:16 1/5 for the 6 1/2 furlongs. Stretching out to two turns in the 1 1/16-mile Breeders’ Futurity at Keeneland, he ran a winning race, coming from sixth to take the lead by a length at the eighth pole, but got nailed in the final sixteenth by the late-closing Brody’s Cause. He followed that up with a strong fourth-place finish in the Breeders’ Cup Juvenile, beaten three lengths by Nyquist and missing third by a neck to Brody’s Cause. Despite having six starts in top company, he then headed to Delta Downs in Louisiana for the $1 million Delta Jackpot, which he won by a neck over a muddy track in a gutsy effort. Not much was known about Keith Desormeaux until he captured the Breeders’ Cup Juvenile in 2014 with Texas Red, who inhaled his field before drawing off to a six-length victory. When Desormeaux reverted to old school training and dropped Texas Red back in distance into a sprint (the seven-furlong San Vicente Stakes) for his 3-year-old debut, he was also drawing up the blueprint for Exaggerator to do the same thing the following year. So, Desormeaux, went the same route this year with Exaggerator, who he thought benefited from the light training following the Delta Jackpot and he felt confident he was coming up to winning effort. But he again ran into Nyquist, who was also making his 3-year-old debut, and it took a sizzling seven furlongs in 1:20 3/5 for Nyquist to get the better of Exaggerator by 1 1/2 lengths. Following the San Vicente, owner Sol Kumin, who races under several stable names and owns the remarkable filly Lady Eli along with fellow Sheep Pond partner Jay Hanley, was looking to buy into a Derby horse and was able to secure a 20 % interest in Exaggerator under the name Head of Plains Partners. “There wasn’t much not to like about Exaggerator,” Kumin said. 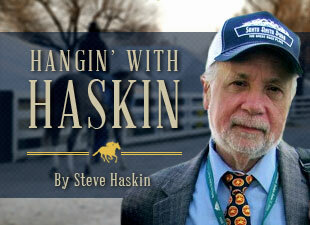 “As you know a big part of my program is buying horses that are already running. We didn’t think we had anything in our current stable that had a shot at the Derby this year (My Man Sam really came on strong late and surprised us), so we looked at all the potential Derby horses in January and tried to find the ones we thought had the talent to get there and win and that were owned by someone you could potentially buy from. Shadwell, Paul Reddam, Mike Repole, etc. are not sellers when they have a nice colt, so it really came down to two horses, Exaggerator and Danzing Candy, that we liked and felt like we might have a chance to buy. In the San Felipe, Exaggerator uncharacteristically dropped far back, something he’d never done before, and then turned in an electrifying run to reach contention, but was unable to sustain it, finishing third. Even Desormeaux, after looking at Exaggerator’s Trakus fractions, which are based on GPS, started having some doubts about his ability to go classic distances. Exaggerator had run very fast second and third quarters in :23.09 and :23.89, but slowed down significantly after that. Some believed those inner fractions were too fast to sustain such a pace and Exaggerator, by coming from far back for the first time in his life, wasn’t as in control of his move as one would have liked. This was something brand new for him. Although Desormeaux still was unsure how far Exaggerator wanted to go, he hoped the San Felipe performance was more a case of the colt regressing (bouncing) off his blazing fast time in the San Vicente. “I sure hope he bounced,” he said. “He deserves another shot. It will be great fun and challenging to try and get this done, but I have no pressure. He has been a great investment either way. It would take Kumin, the other owners, and Desormeaux only one more race, the Santa Anita Derby, to wipe out all thoughts of the King’s Bishop and set their sights on the Kentucky Derby. It not only was a credit to the colt’s class, but to Desormeaux’s ability to get into a horse’s head and have him do things most horses wouldn’t be able to. Hey, any horse who can play fetch with a Jolly Ball by throwing it over his fence and likes to eat while laying down in his stall is intelligent enough to be taught just about anything, right? It took Exaggerator only that one race to figure out his new role. All he was being asked to do was transform himself from stalker to Silky Sullivan. In the Santa Anita Derby, he turned in one of the most explosive moves seen in years, blowing by the field in a flash and drawing off to a resounding victory. Many attributed it to the slop and a scorching pace set by Danzing Candy, but this performance was so spectacular it transcended simply relishing a wet track and fast pace. Desormeaux now knew he had a legitimate classic horse on his hands, and one of the favorites for the Kentucky Derby, but still wasn’t sure how much of the victory to attribute to the pace meltdown. Desormeaux showed not an ounce of disappointment or second guessing, but was thrilled with Exaggerator’s performance, and felt it was a great accomplishment to finish second to an undefeated champion who had now beaten him eight times, including six seconds. “It’s been a whirlwind couple of weeks,” Desormeaux said. “As you know, there are always nuances in training these volatile animals and Exaggerator is no different. He can be tough at times. With that being said, I have a new set of hands on him performing his daily gallops in Kentucky. Exaggerator has really taken a liking to this new guy. I’m optimistic that he can get better and close this gap on Nyquist. At least it will help fuel my confidence, false or not, in order to challenge him again. 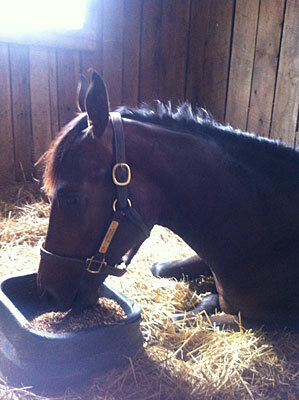 Nyquist is one tough s.o.b. In the Preakness, things started looking favorable for Exaggerator when he drew post 5, while Nyquist drew post 3, with speed horses directly inside and outside of him. Then steady rains overnight night and prior to the race turned the track into a sea of slop. Exaggerator’s chances really started to look good when Mario Gutierrez gunned Nyquist to the lead, despite having two horses intent on the lead on either side of him. When that first quarter in :22 1/5 flashed on the board it was like a dagger in the heart of owner Paul Reddam, who knew right then Nyquist was in big trouble. His horse had just run the fastest opening quarter in the history of the Preakness. Nyquist never got a break, dueling back and forth with Uncle Lino, who was like a terrier refusing to let go of a pant leg. Although they were able to slow the pace down with each subsequent quarter, it is that first quarter that does the damage, ultimately taking its toll down the stretch, especially when you’re running in a quagmire. Kent Desormeaux, meanwhile, had Exaggerator down on the rail, nearly a dozen lengths back, as Keith tried to figure out what his brother was doing on the inside. But like last year, also run in the slop, the inside actually looked to be the best part of the track, if you go by Exaggerator’s trip and Cherry Wine’s powerful stretch run along the inside. Kent took advantage of Exaggerator’s rapid-fire middle move and quickly sent him into a contending position right behind the dueling Nyquist, ready to strike at any time. By the time they turned for home it was the two favorites battling it out again, as Exaggerator came off the rail to launch his bid. But with those opening fractions and never getting a breather, it took its toll on Nyquist, and Exaggerator roared past him and quickly opened a clear lead. Nyquist tried gallantly to fight back after being pulled out when Exaggerator cut in front of him, but he was spent, and just got nipped right on the wire for second by Cherry Wine, who got banged up pretty good after hitting his head on the gate. It was a taxing effort on Nyquist, who came out of the race with over a 102-degree fever after leaving feed both Saturday and Sunday night, suggesting he may have been incubating a virus and it came to a head from the stress of the race. If so, it says a lot about the horse, trying as hard as he did. But it shouldn’t detract from Exaggerator’s performance. He won convincingly, and this was his day. Nyquist is unbeaten no longer, and Exaggerator finally has pulled that thorn from his and his trainer’s side. “That was unbelievable; I was going crazy,” said Sol Kumin, watching the race from the infield. Kumin, in just a few years in the business, has had more unforgettable moments than most owners do in a lifetime. So, there will be no undefeated horse trying to sweep the Triple Crown this year, but there is one heck of a rivalry forming between two exceptional Thoroughbreds, who first faced each other way back last June when they were just the 7-1 first-time starter Nyquist and the 28-1 first-time starter Exaggerator. Now they are the kings of the 3-year-old division with 20 starts between them and the brilliance, courage, and toughness to keep the division at the highest level all year. For Exaggerator, he no longer is Buster, but he’s still just as cool. He is now a finely conditioned athlete who has shown remarkable adaptability and who thrives on competition, much as he did playing fetch as a youngster. But now, unlike their first four meetings, not even Nyquist can take that Jolly Ball away from him.